It is hard to believe that until now, I had never read Matilda by Roald Dahl. It just seems like one of those books that I should have read a long time ago. Luckily, it’s never too late to repent and read! Matilda, the title character, is a sweet five year old child with a most formidable intellect and more natural gumption than any of the grown-ups in her life. Her father is a crook of a used car salesman and her mother is a simpering, shallow nitwit and neither of them are capable of recognizing or appreciating the gifts and talents displayed by their precocious daughter. On Matilda’s first day of school she encounters the lovely and sweet Miss Honey, her teacher who is fully capable of recognizing Matilda’s potential. She also encounters “The Trunchbull,” a legendary horrific beast of an awful woman, who is so foul and vile-tempered, she strikes fear into the heart of every man, woman and child who crosses paths with her. Matilda takes it upon herself to bring the Trunchbull down and she does so in the most creative and thorough way possible. Matilda is a fast read with a fun paranormal quirk of twist. 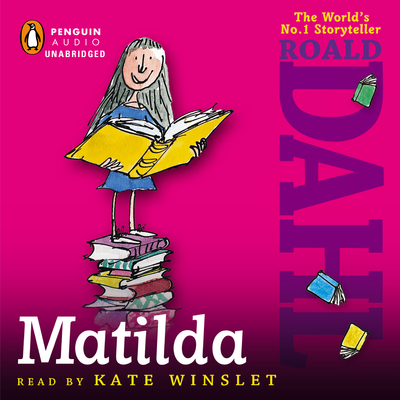 Though technically a children’s book, Roald Dahl’s fantasies and fairy tales will appeal to adults as well, and Matilda is no exception. Kate Winslet gives a wonderfully whimsical performance on this audiobook. Her voices for each of the characters are spot-on. She gives Matilda an impish, almost adult-like curiosity, without losing her childlike tone; Miss Honey is winsome and sweet; and The Trunchbull, though comical for her sheer absurdity, is aggressively cruel. Bottom Line: Gorgeous rendering of a cautionary tale for mean and vile grown-ups. Full Disclosure: I received my free review copy from Penguin Audio. I received no compensation for this review, and the thoughts/opinions expressed are entirely my own. Matilda is available in stores now in book and electronic book format, as well as audio. This entry was posted in Award Winners, Fiction, Posts by Izzy and tagged audiobooks, Matilda, Roald Dahl. Bookmark the permalink. Yeah! you’re back! I loved this book too. I would love to listen to this on audiobook with Kate Winslet! Woot! I enjoyed the movie, too. I need to get on this!